Indonesian President Joko Widodo has disappointed and bewildered international investors and undermined the government’s credibility by announcing that infrastructure for one of the world’s biggest gas fields is to be built onshore despite concerns that the onshore plant is economically not viable. In doing so, he finds himself at the center of a tug of war between economic nationalists and reformers over who gets the spoils from economic development in Indonesia, regardless of whether such decisions are viable. 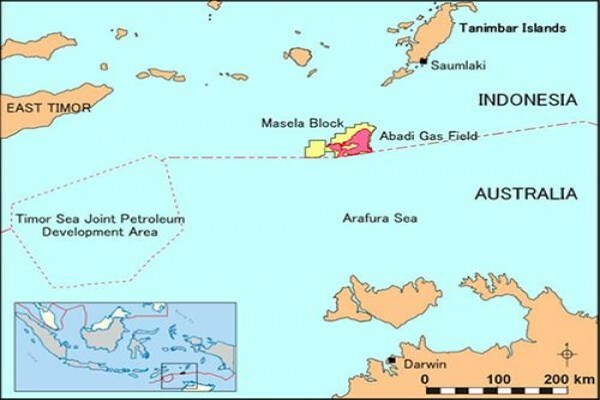 On one side in this particular matter is Energy and Mineral Resources Minister Sudirman Said, who was on the verge of signing a 65-35 joint agreement with Inpex of Japan and Shell respectively – who have been working to bring the field online for 16 years – when Coordinating Minister Rizal Ramli emerged to attempt to block it, arguing it would not benefit the local economy. Also at risk is Indonesia’s own economy, which is expected to become a net importer of natural gas in 2019, meaning the country’s deficit can only grow if the gas-rich Masela block is not brought online. Reserves in the block are estimated at least of 10 trillion cubic feet of gas although some estimates say the reserves could, on full exploration, reach as high as 40 trillion cu ft. It is estimated that the block would produce 7.5 million tonnes annually starting in 2024 when the project was expected to be up and running. However, revising the plan of development is expected to delay it for several years, driving up the cost, already more than US$14.5 billion. A 3,500 meter-deep trench lies between the field and the projected onshore plant, making it unfeasible to pipe the gas onshore in Indonesia. The onshore terminal cost is estimated at US$19 billion. Officials say it would make more sense to pump the gas 400 km. to the LNG processing terminal in Darwin, Australia. In any case, the Inpex-Shell concession lapses in 2028, meaning they may have to renegotiate in order to finish it. It is certain that the delay will cut the commercial attractiveness of the development at a time when global commodity prices have descended sharply and show no signs of recovering as supplies have burgeoned across the world. The decision is emblematic of the continuing conflicts in the administration, with Jokowi, as the president is known, telling the world the country is “open for investment” at the same time the government itself backtracks and creates delays on a wide range of projects, many of them in the resource extraction field. Jokowi during the earlier days of his presidency was considered a disappointment to reformers who elected him on the basis of his heartening attempts to clean up the sprawling megalopolis of Jakarta. He was regarded as being in the clutches of Megawati Sukarnoputri, the head of the Indonesian Democratic Party of Struggle (PDI-P), who was controlling many of the appointments to his cabinet and working on the side of the economic nationalists in several areas. Jokowi dramatically reshuffled his cabinet last August, getting rid of nationalists and some of Megawati’s deadwood and appointing technocrats and reformers to replace placeholders. But one of those appointed to the cabinet was Rizal Ramli, a prominent economist who served as Coordinating Minister for Economic Affairs and Minister of Finance in 2000 and 2001 in the administration of President Abdurrahman Wahid. The maritime affairs ministry is an extremely powerful job, coordinating energy, tourism, maritime and is a big focus for infrastructure development. Almost upon his appointment, Ramli began asking why the regulator SSKMigas and Sudirman had approved the capacity of the floating gas terminal proposed by Inpex. Even though a New York-based consultancy brought in by Ramli himself to study the project agreed that the floating terminal is the most viable, he continued to oppose it. Economic nationalism is a tide that Jokowi has been fighting, and sometimes rolling with, since the day he came into office, with many top government officials insisting Indonesia would benefit more by taking over the management of its own resources, which reformers regard as an excuse for enriching themselves. That has resulted in billions of dollars of lost opportunity that Jokowi and Sudirman Said have sought to reverse. The fight has turned ugly, with Ramli and Sudirman attacking each other on their twitter accounts. Since his cabinet reshuffle last August, Jokowi has rolled out a continuing series of economic reforms culminating on Feb. 10 with the details of a sweeping plan he called a “big bang” to open nearly 50 sectors of the economy to foreign investment that is designed to ease investment rules in e-commerce, retail, health care and moviemaking. Nine new packages have been made public since a Cabinet meeting in Bogor shortly after the reshuffle, cutting red tape, removing obstacles and opening up for investment. The sweeping changes in the latest package, the 10th in the series, are aimed at dramatically pruning the so-called ‘Negative Investment List” that keeps out investment by foreign interests. The decision to go against the floating platform, however, outlines a picture of an administration at war with itself even to the point of harming Indonesia’s own interests.